Mild to moderate hypophosphatemia has not been conclusively linked with significant clinical problems such as severity of illness, concomitant electrolyte abnormalities, length of stay, or outcome (Kruse.e.ta.l 1992). Major clinical sequelae occur only as a result of severe depletion. 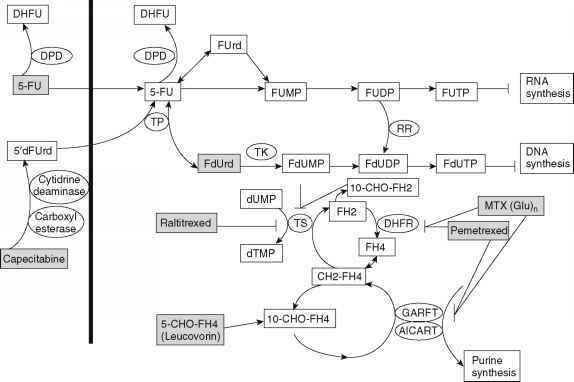 Acute problems of phosphate deficiency are related to either decreased production of 2,3-diphosphoglycerate (2,3-DPG) in red blood cells with a concomitant shift in the oxygen dissociation curve to the left, or the reduction in the formation of high-energy phosphate bonds seen in ATP etc. 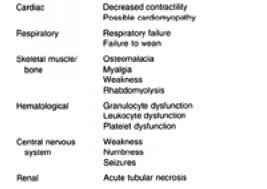 A list of these clinical effects is given in Table.4.. Of particular relevance to the critically ill population is the decreased oxygen delivery as a result of both decreased 2,3-DPG and decreased cardiac output from decreased contractility and occasionally a cardiomyopathy. Hypophosphatemia is also implicated as a reversible cause of failure to wean from ventilatory support, although it is unlikely that this is often a significant factor on its own. Although there are no studies relating the independent predictive value of severe hypophosphatemia to outcomes, treatment is relatively safe and effective and therefore should be implemented in all cases.